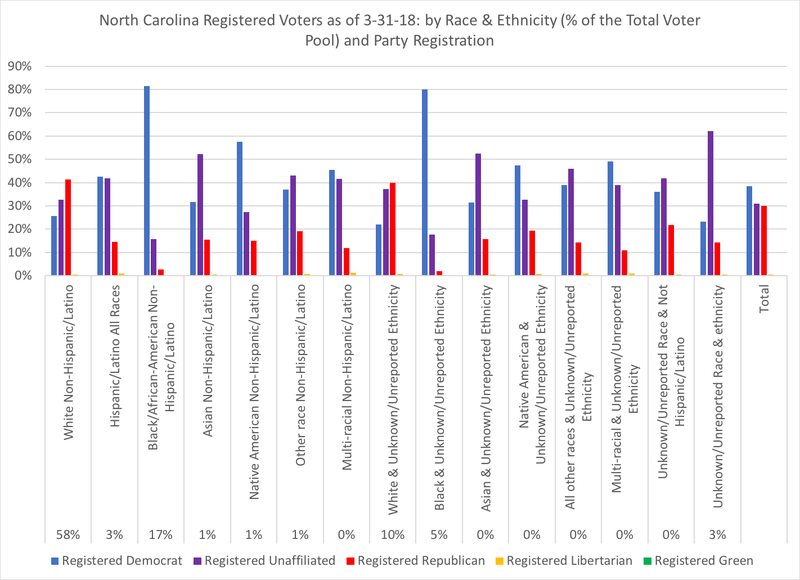 While April 1 lands on a Sunday, the latest North Carolina State Board of Elections & Ethics Enforcement data, posted on Saturday, March 31, gives information about the 6.9 million registered voters in the state. First, the state's political party registration among these voters breaks down as 38 percent registered Democrat, 31 percent registered unaffiliated, 30 percent registered Republican, 1 percent registered Libertarian, and 0.000004 percent (or, 3 voters) who have registered with the recently approved Green Party in the Old North State. 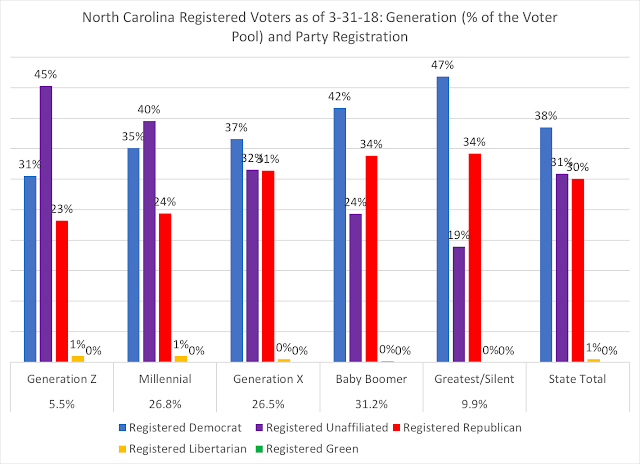 Those voters under the age of 37 (Millennials, who are 22-37 years old, and Generation Z, who are 18-21 years old), account for 32.3 percent of the voter pool, while Baby Boomers, at 31.2 percent, are the second largest generational cohort (those voters between the ages of 54 and 73 years old). 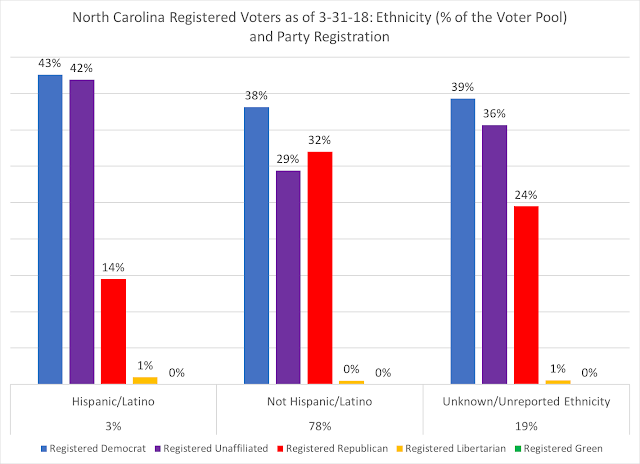 The nearly 200,000 Hispanic/Latino voters, no matter the race, are registered predominately either Democratic or unaffiliated, with only 14 percent as Republican. 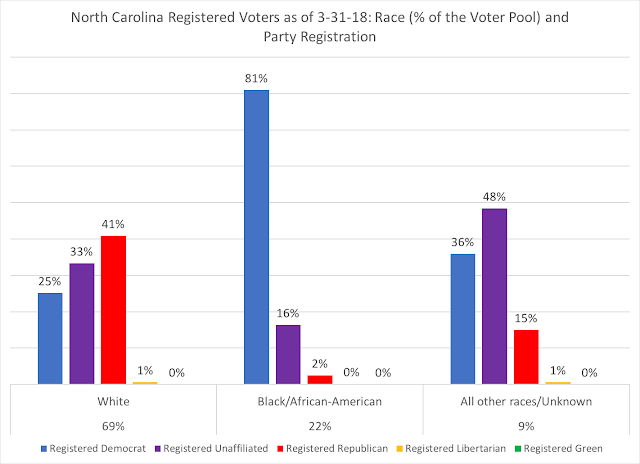 With a little over 4 million registered voters, white non-Hispanic voters make up 58 percent of the voter pool, with 41 percent registered as Republicans, 33 percent as unaffiliated, and 26 percent as Democrats. Nearly a quarter of North Carolina's voters reside in suburban counties, which are predominately Republican in registration. 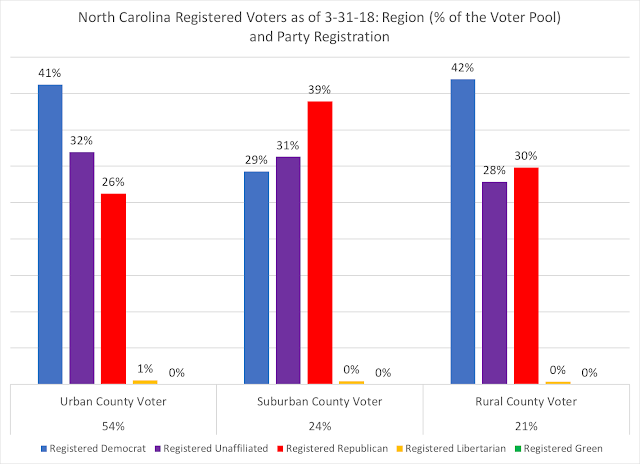 Rural counties, with a significant portion of voters who are older (Baby Boomers and Greatest/Silent generations are 47 percent of rural voters) skews Democratic in registration, but tend to vote Republican. 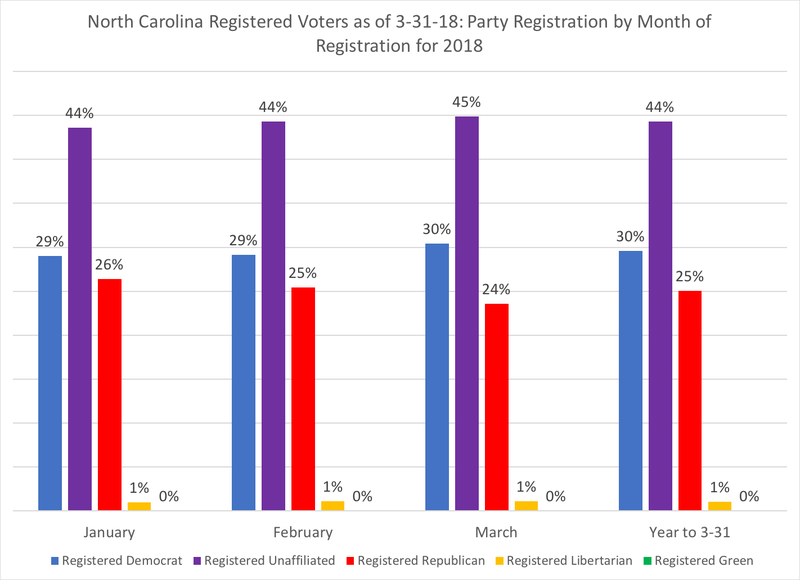 Since the beginning of 2018, January and February both saw over 26,000 new voters added to the registration pool each month, while March saw over 29,000 new voters registered. 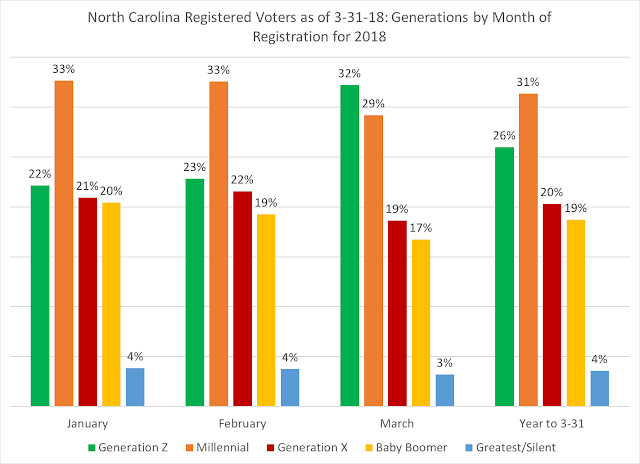 For the first three months of 2018, a significant majority (57 percent) of new voters registering were either Millennials or Generation Z. The noticeable spike in Generation Z (18-21 year olds) could be attributable to the news and activism of youth. It will be critical to watch this trend over the next several months to see if this pattern of young voters registering will continue. The slight tick down of Republican registrations since the beginning of the year should be something to watch as well, along with registration for the newly approved Green Party. 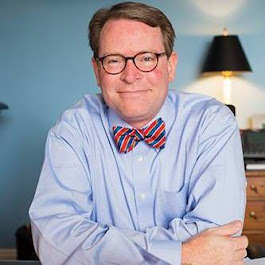 One of the important aspects of this new party is that registered Green voters will only be able to vote in their party's primary elections in the future, unlike unaffiliated voters. 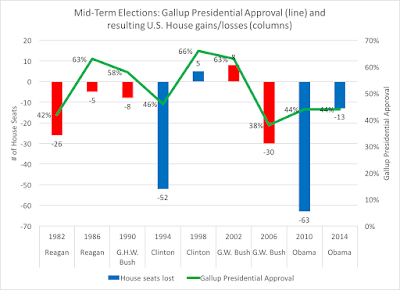 That will be interesting to watch play out over time, along with what kind of generational dynamic is at play with Green Party membership. I will continue to track these dynamics at the beginning of each month.